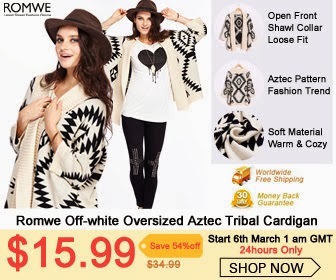 Romwe Off-White Oversized Aztec Tribal Cardigan Now on SALE! Hello dearies! It's sale time once again from Romwe. This cardigan is always the best seller from July to now. And now, they have improved the quality and the packing, but the price will be only $15.99 on 6th March. wow,. Lagi na lang sale sa ROMWE,. sana DRESS uli ang i-sale nila,. yup, daming sale sa ROMWE. Ang daming selection ng magagandang damit.